Despite my lack of free time currently, I have been re-inspired to get back to antler and bone as a medium for tool production. My only issue with them is that they are enormously time intensive. Even using a modern saw and occasionally a steel rasp these take a lot of energy to make. However, the end product is amazing and I would really think they are often underestimated in the archaeological and primitive technology communities. The rarity of these materials leaves most of us with such a lack of familiarity with them that they take a back seat to lithic weapons in study. A little experiential archaeology goes a long way to clarify the devastating effectiveness these points have. 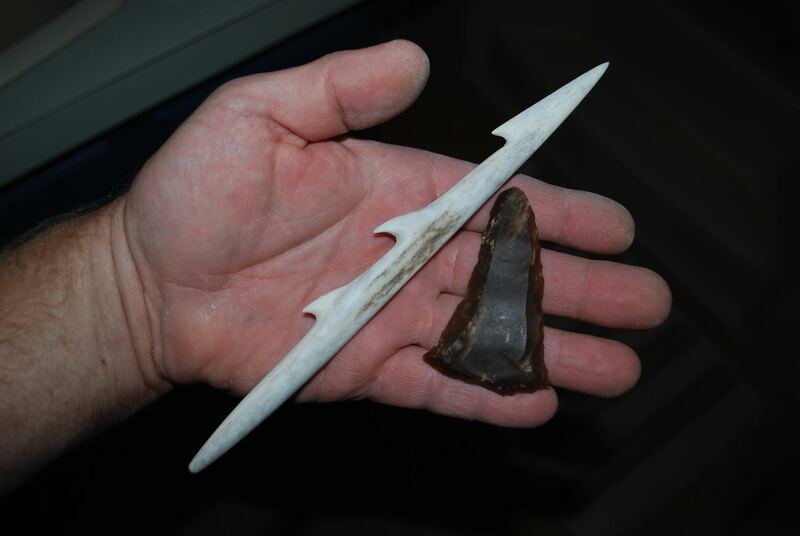 Antler point and “scraper”-like tool used to produce it. Archaeological terms that include function in the name are loaded from the beginning. The term scraper is bandied about with little regard for the tool’s actual function. I believe, and experiments bear this out, that the type of unifacial knife-scraper-planer combo, shown above, was the essential backbone of a hunter’s tool kit for much of our prehistoric past. I don’t have ready access to the beautiful reindeer or caribou antler so treasured by our Upper Paleolithic ancestors but large mule deer, white tailed deer, and elk can suffice in a pinch. Just as in Europe 15,000 years ago, these would be effective weapons against land or marine mammals of all sized. 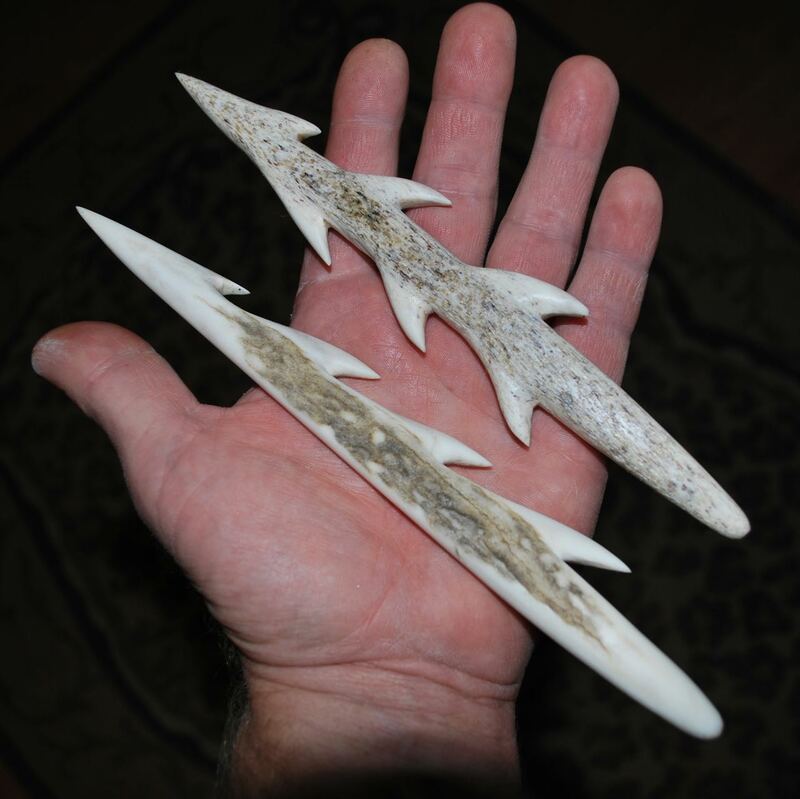 My fairly limited use of antler points in “real life” indicates that antler is much tougher than stone and is easily resharpened if it is dulled or damaged. 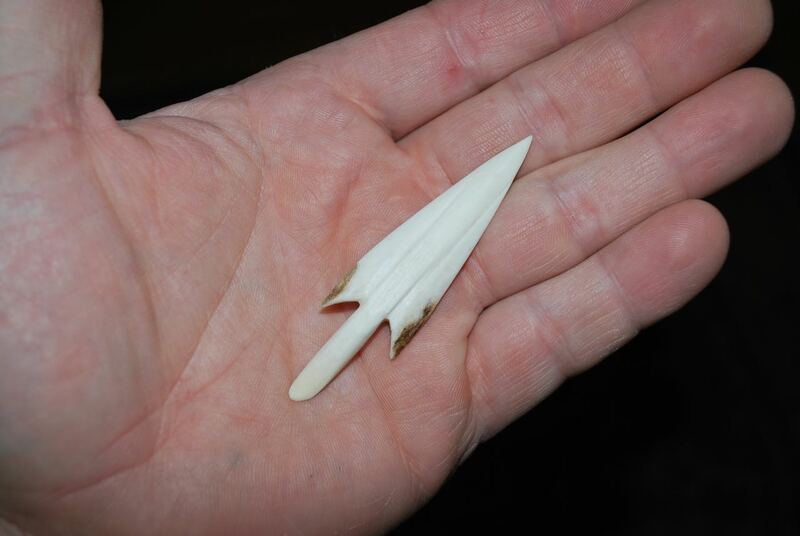 Tanged arrow point of antler. The pithy cancelous (spongy) tissue inside some antler makes them less than perfect for large points. The denser tissue on the outside can be cut off and works well for flat projects, like buttons or, in the above case, an arrow point. 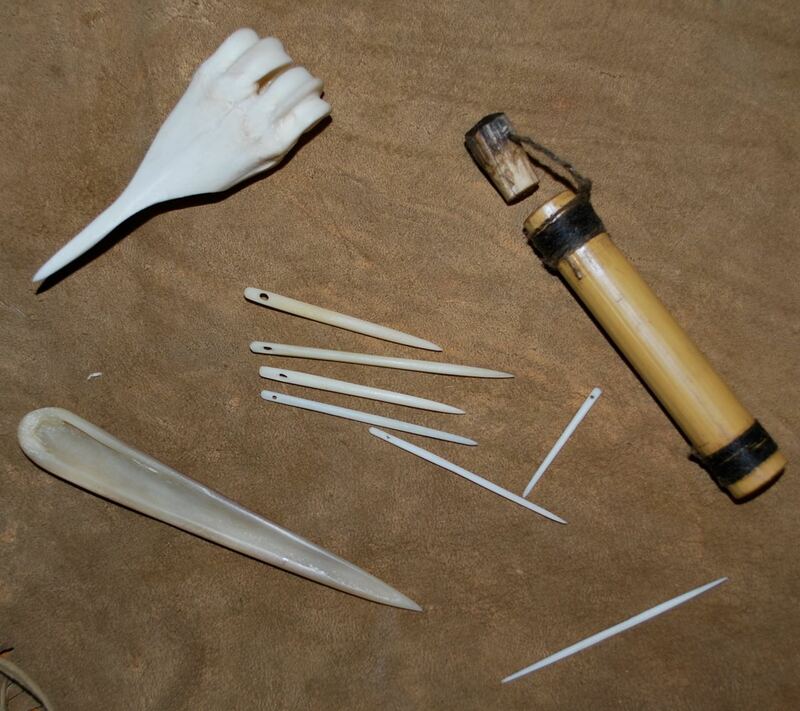 I find that one of the tougher tasks for the primitive craftsman is the making of eyed needles. We know these have been produced for many millennia so we can imply some fine sewing. I find the eye particularly difficult to make but, for what it’s worth, here is what I have learned. After getting the needle close to it’s desired finished size, flatten the area that is to become the eye on each side. This flat area keeps the flake from rolling off the work piece while piercing the bone. Instead of circular drilling, I find it a little more efficient to just scrape a tiny oblong hole by moving the flake tool back and forth. Be patient, this takes a long time. Holding it up to the light will tell how deep you’ve gone. When you are nearly through, flip the needle over and finish the hole from the other side. Once you are through you can slowly widen the hole until it’s large enough to take your intended thread. Finally, you can narrow the cylinder around the eye to make it as small as possible after the eye is safely made. And note: you will break some; those become the short ones. An awl for heavy stitching can be made simply from the metapodial (lower leg) bone of most grazers. 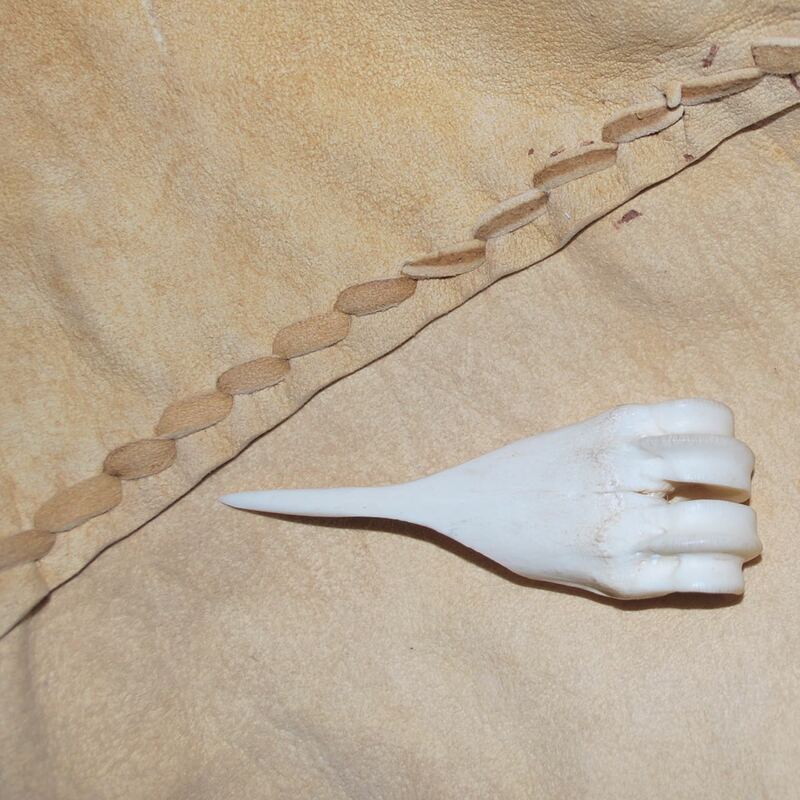 This is a tough and dense bone useful for making fish hooks, needles, knives, etc. The knobby end (metapodial condials) fit in the human hand very comfortably and make a great handle or grip. More tool experiments and replicas are being made around here in the long winter’s evenings and I hope to post them when I get some photos taken. I’ve never made anything from bone, but your work certainly intrigues me. How is the best way to learn? I also wondered if you ever heat tempered any bone as is often done with wood for hardness? Thank you for this. Lovely work. This might sound overly simple but bones are everywhere. Find images of a tool or artifact you want to replicate, and start scraping and rubbing with sandstone. Bone is very hard and boiling out the grease will make it much better and less likely to be stolen by the dog later. Thanks for posting. I’ve got an abundance of bones around my property due to it being open range for cows. I’ve been doing some artistic stuff, but would love to give it function. 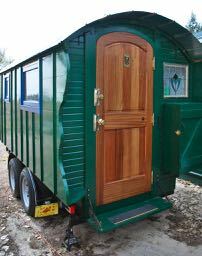 Especially the awl! Beautiful works and historical repros! This post is like a chapter in an experimental archaeology handbook! Thanks. That’s an honor to hear.